When single mom Taylor Lawrence discovers the hospital accidentally sent her home with the wrong baby five years ago, she’s stunned. Now the headstrong and handsome biological father wants his child back. But Emily is her daughter, and Taylor isn’t about to give her up without a fight. Widower Reece Wallace believed his life was over when he lost his wife and daughter in a tragic accident. Then he finds out about Emily. He’ll never forget his first daughter, but maybe life was giving him a second chance. He could never have anticipated the fiery woman on the other side of this custody battle, though, or how she’d stir feelings in him long dormant. 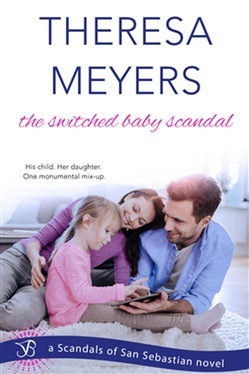 As the media storm surrounding the hospital’s mistake intensifies, Taylor and Reece find there’s more to sort out than custody of Emily, and that sometimes love can be found in the most unexpected places. Acquista The Switched Baby Scandal in Epub: dopo aver letto l’ebook The Switched Baby Scandal di Theresa Meyers ti invitiamo a lasciarci una Recensione qui sotto: sarà utile agli utenti che non abbiano ancora letto questo libro e che vogliano avere delle opinioni altrui. L’opinione su di un libro è molto soggettiva e per questo leggere eventuali recensioni negative non ci dovrà frenare dall’acquisto, anzi dovrà spingerci ad acquistare il libro in fretta per poter dire la nostra ed eventualmente smentire quanto commentato da altri, contribuendo ad arricchire più possibile i commenti e dare sempre più spunti di confronto al pubblico online.